Nick Roberto, who scored his second goal of the season against BC on Friday was named to the Hockey East Top Performers list for the week. With the loss, BU slipped out of the USCHO rankings. Next up for BU is Friday’s visit to Maine’s Alfond Arena. 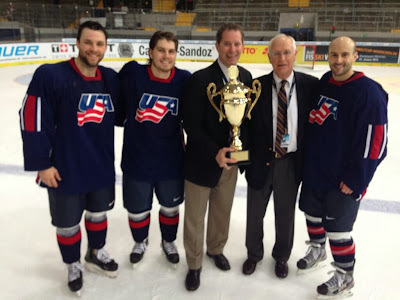 The game has been added to the Fox College Sports/Atlantic schedule and will air at 7 p.m.
Former BU captain Pete MacArthur scored the game-winning goal for Team USA in the gold-medal game of the 2013 Deutschland Cup in Munich, a 7-4 win over Germany. Team USA, coached by retired Terrier coach Jack Parker and assisted by Mike Bavis, also featured two ex-BU standouts, Chris Connolly and Chris Bourque, each of who contributed three points during the three-game event. Coming off a solid seven-point performance at the U18 Four Nations Cup, Jack Eichel now has 20 points in 12 games. That’s a pretty high scoring clip for the U18 year. He had to miss time with injury, but looks as good as ever. Of the under-age players, I think Eichel would probably end up the most likely to make the team, if any do at all. He’s a strong center with good skating and skill. Though the NTDP also plays in the USHL, the fact that they play college competition is part of the separating factor. It helps prepare them a bit more for the level of play at the World Juniors, so that’s why I think Eichel has an advantage, if only a small one over outside under-age players. The young 1996-born player is not even draft eligible until 2015, so if he were to make the team, it would be a huge boost to him in this early stage. Terriers were again named Hockey East Team of the Week after recording three conference wins for the second week in a row. Freshman forward Maddie Elia—six points, including 2+2 in Saturday’s 5-1 drubbing of Maine—earned Hockey East Rookie of the Week honors for the Nichols School product who is now third in scoring on the team. Top Performers for the week included Kaleigh Fratkin, Sarah Lefort, Kerrin Sperry and Samantha Sutherland. BU, which moved up to #8 in the USCHO rankings, is now 6-0-0 in conference play and has posted 21 consecutive league wins dating back to last November. 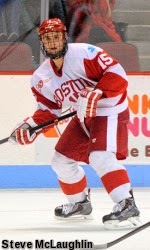 BU heads to Vail, Colorado, this weekend for a neutral-site tournament that will match them against two WCHA teams: St. Cloud State and #2 ranked Wisconsin. 64 years ago today, iconic baseball announcer Vin Scully made his radio debuting doing play-by-play of BU vs. Maryland football from the roof of Fenway Park. BU, led by future All-American quarterback Harry Agganis, went into the game with a 6-0 record, but were edged by the Terps, 14-13.